Roads and sidewalks will refreeze overnight, and several D.C. area school districts have already decided to stay closed Wednesday. The majority of public schools in the D.C. area, along with the federal government, closed Tuesday after a wintry storm dumped several inches of snow onto the region. The storm dropped at least 4 inches of snow on the metro area; 6 inches piled up in some areas south of D.C. Winter storm warnings are effect until noon Tuesday. Untreated roads and sidewalks will remain hazardous with an overnight refreeze. Then Wednesday, another arctic front could bring more snow. A 15-30 minute burst between 5 p.m. and 9 p.m. is expected to leave a trace to a half inch of snow, which will stick because of the cold. Then wind chills will drop to zero and below into Thursday. Friday could set a record low of 4 degrees for Feb. 20. The federal government's closure, the first of the winter, was expected to keep tens of thousands of commuters off the roads and rails Tuesday. The U.S. Office of Personnel Management said non-emergency personnel in the Washington area had excused absences, while emergency employees and telework-ready employees were to follow their agencies' policies. D.C. Mayor Muriel Bowser announced the city government's closure early Tuesday morning ahead of a snow emergency that went into effect at 7 a.m. and continued until 2 p.m. More than 130 cars were ticketed and towed. Violators of snow emergency parking restrictions face a $250 ticket, a $100 tow and a $20-per-day storage fee until they pick up their vehicles. The snow emergency is designed to allow transportation workers to clear snow emergency routes curb to curb. Property owners are asked to clear their sidewalks and help their neighbors clear theirs if needed. WMATA suspended Metro Access service, while Metrorail is running on a Saturday schedule. Metrobus service was suspended overnight and operated under a severe snow plan Tuesday until transitioning to a moderate snow plan at 1:30 p.m., meaning more routes were in service with detours to keep buses off hills, narrow side streets and other problem areas. Rail and bus service are expected to return to normal Wednesday, but delays and detours are possible as road conditions require. The D.C. Taxi Commission began a $15 surcharge at 7 a.m. Tuesday. It is set to expire at 7 p.m. In advance of the storm, Virginia Gov. Terry McAuliffe declared a state of emergency in the commonwealth. 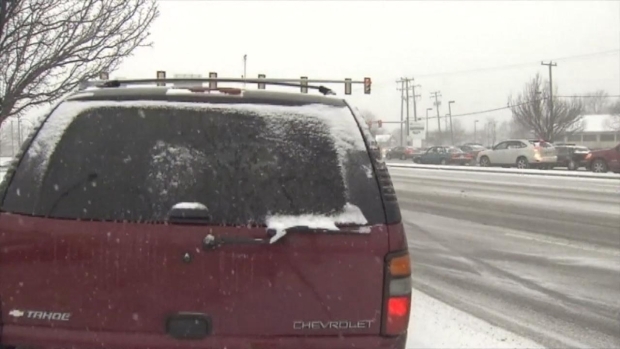 "This could be the worst storm we've had in Virginia in five years," the governor told News4. Snow stuck to roads across the area, reducing visibility to one half-mile or less at times as the snow fell. The combination of snow-covered roads and low visibility made traveling dangerous. Virginia State Police responded to thousands of accidents across the commonwealth. RAW VIDEO: In Hampton, Virginia, Monday, an out of control SUV struck another vehicle before stopping inches away from a news camera for NBC's Norfolk affiliate. The photographer was safe in a nearby news truck at the time. In Loudoun County, officers were called to the scene of a fatal accident at the intersection of Route 15 and Route 50 just after 10 p.m. Monday. The road reopened by 2 a.m. Tuesday. A state trooper was also injured while responding to a call in the northbound lanes of I-495 just after 6 a.m. Tuesday. Police say the trooper was invetigating an accident near Exit 45 when his patrol car was rear ended by another vehicle. The trooper was taken to a local hospital for treatment. One fatal crash was reported in Maryland Tuesday morning. A southbound driver apparently took a curve too fast on Route 97 at the Howard-Montgomery county line, hit a patch of slush on the right shoulder, and swerved sideway in to northbound traffic where he was struck by a pickup truck. Zeyu Zhang, 26, was pronounced dead at the scene, and three teenagers in the pickup were taken to a hospital with minor injuries. The road had been plowed. Transportation officials asked people to stay off the roads. Pre-treatment chemicals are less effective when the temperature is below 20 degrees. Due to the subfreezing temps, the Virginia Department of Transportation (VDOT) added sand to its normal mixture to give cars a little more traction. "When the temperatures are going to be as low as they are [Tuesday], in the teens and 20s and even below, the chemicals don't work well on the roads," said Steve Shannon of VDOT on Monday. "There's no chemical that really does." McAuliffe said up to 2,500 VDOT workers and contractors were prepared to work in shifts to treat roads and haul off snow statewide. Almost 12,000 pieces of equipment were prepared Monday, as well as more than 550,000 tons of salt, sand and other abrasives and 565,000 gallons of calcium chloride and brine. VDOT said its goal is to have all state-maintained roads passable within 48 hours after a winter storm ends. Montgomery County offered free parking in county-owned lots and garages to encourage residents to park vehicles off roadways and to ease Montgomery County's snow removal efforts, according to a press release. Parking fees were suspended in lots, garages and metered spaces. Hundreds of flights have been canceled at the three major airports in the Washington-Baltimore region. The flight tracking service FlightAware.com shows that more than 215 flights in and out of Reagan National Airport were canceled Tuesday. At BWI-Marshall Airport, about 60 flights had been canceled. And at Dulles International Airport, more than 50 flights were canceled. Amtrak will continue operating under a modified schedule Wednesday. Grocery stores turned a brisk business Monday, as shoppers loaded up on staples in advance of the severe weather. "I got milk and bread, but also dog food," said shopper Donna Michael.